Everyday thousands of our users rely on Koding University to get answers about stuff they either know nothing about or just to fact check. It’s the #1 linked resource when it comes to questions the community has. But, as with everything, there was room for improvement. Today, we are excited to announce the next evolution of Koding University. 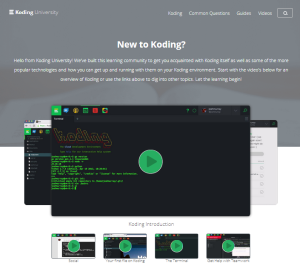 Specifically, we’ve now made is much easier for anyone to contribute meaningful articles and guides for inclusion in Koding University’s growing repository of how-to articles and guides. With this new launch, all our guides are now hosted as a repository on Github and use markdown for formatting. To contribute, all you need to do is fork the repo on Github, add your guides and do a pull request. We will evaluate each submission for content quality and ease of use and if approved, merge it into the master branch from where it will seamlessly appear in our “Guides” section. A handy guide has been put in place to help you with the steps necessary if you want to contribute. So if you’re good at something, no matter what the topic is, you can now write a guide for it or make a video for it, make a pull request to our repo on Github and then enjoy the fruits of your glory while knowing you helped other fellow Koders. Every approved guide will carry a full credit to the author. Looking forward to seeing your contributions!